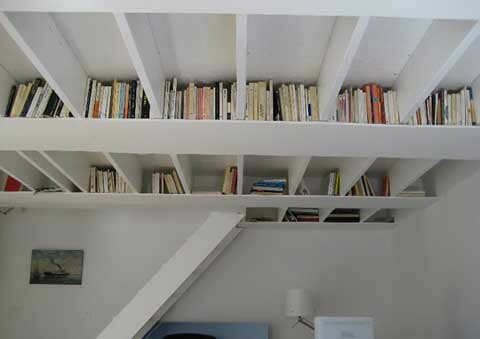 ceiling-bookshelf, a photo by courtfkizer on Flickr. I am not a Paul Simon fan. I did buy Graceland when I was in high school, because I really liked “You Can Call Me Al” and “Boy in the Bubble” at the time. It is a really really good album, and I do still appreciate it, but other than that and maybe “Kodachrome”, I don’t listen to much Paul Simon. Wait – I thought of one more – I love the Yes cover version of “America”. Does that count? I still read the article about Paul Simon in Rolling Stone. Why? I am not sure. It was sitting there in front of me and I just thought, “I wonder if there is something about Paul Simon I am missing”. So I read the article and halfway through I realized I should be reading something else. Then I came upon a paragraph about Art Garfunkel, and there was something cool: Art Garfunkel keeps the book on his bookshelf in the order he’s read them. What an awesome idea! So he knows the order he’s read them, which is pretty cool, and he puts a “ladybug” sticker on the spine of the books he really liked. Another cool idea. He’s read over 1,000 books. I can’t do this myself because I sell back the ones I’ve read and don’t feel like I need to keep through Amazon so I can get more money for books. But if I didn’t have that issue, I’d definitely do this. Who knew Art Garfunkel could lay down something cool on me?